There are many free file hosting services out there offer file hosting for every file formats but rarhost is free file hosting only designed for .rar files. you can upload an unlimited number of .rar (WinRAR) files and share with your friends. Limit is 150Mb per file with no upload limit. No signup required but FREE signing up will get the benefits to manage your files and check how many times a file has been downloaded. 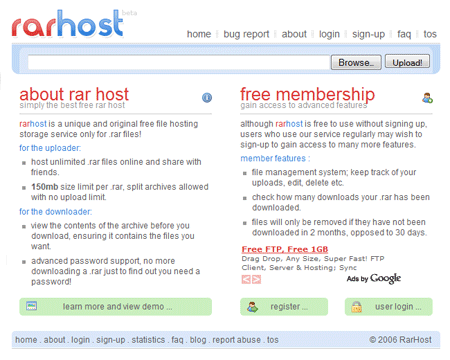 host unlimited .rar files online and share with friends. 150mb size limit per .rar, split archives allowed with no upload limit. view the contents of the archive before you download, ensuring it contains the files you want. advanced password support, no more downloading a .rar just to find out you need a password! Normally we’re using port number 22 for SSH. If you want to change default port number from 22 to other port number or add another ports for SSH, you can edit in sshd_config under /etc/ssh. To edit sshd_config file, type the following in Terminal or SSH client (SSH Secure Shell or Putty). Find “Port“. And change 22 to any port number you want or add another port numbers below. New version of wordpress 2.6 includes Image captioning feature that automatically adds caption under your images like in BBC and CNN news site. It is pretty good if you like. But what if you don’t want to put little caption under your image? Here is a very simple trick. After successful logged in your wordpress, you’ll see the wordpress dashboard. 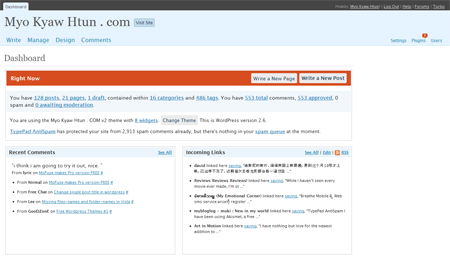 WordPress Dashboard includes Write, Manage, Design and Comments panel. Write panel where you can write new post, page and link (blogroll). Manage panel where you can manage posts, pages, categories, Tags, Media, Importing posts from wordpress xml file or other blogging system. Design panel where you can change or edit your themes uploaded in your server under wp-content/themes folder. Comments panel where you can handle all the comments such as deleting, editing and marking comments as spam for your posts. The rest are Setting, Plugins and Users. WordPress dashboard displays all the information like Recent comments, Incoming link, News feed from WordPress Development blog, popular plugins from WordPress plugin directory and other wordpress news. Michael Sync is running a writing contest for Silverlight 2 developers in his blog. 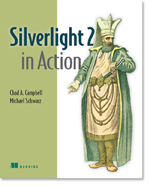 He’ll give away 5 copy of Silverlight 2 in Action ebooks and $300 for contest winners ($200 for 1st and $100 for 2nd). Write a great article about Silverlight 2-beta2. Please encourage all people you know to participate in this contest. Because we need at least 3 participants for this contest. Otherwise, our contest will be failed. I’ve covered Skreemr mp3 search engine before. 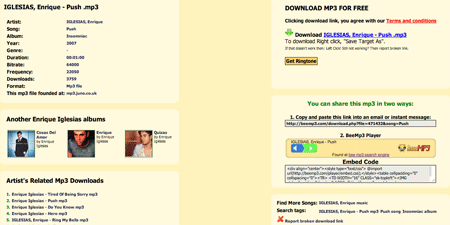 Beemp3 is similar to Skreemr which is a music search engine that has huge list of mp3 files available on the internet. It also displays information for each mp3 files like bitrate, duration, size and frequency like Skreemr has. Currently, It indexed more than 800,000 mp3 files and added 10,000 mp3 files daily as they mentioned. If you can’t find mp3 files in Skreemr, Beemp3 is an alternative way. If you’re familiar with bookmarking services like del.icio.us, you would probably find that Readbag isn’t a fantastic one. Readbag is a tool that let you store the links which you want to read later on. It will automatically archive the links after you visited in Readbag. 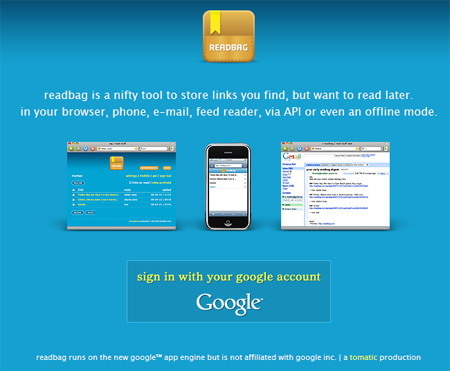 Readbag uses Google App engine so you only have to login with your Google account. 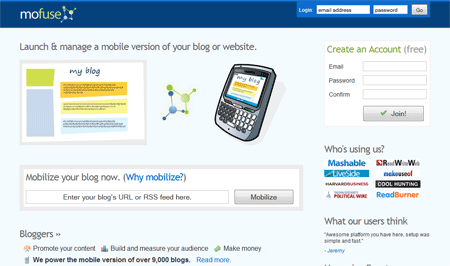 Readbag has options to share your links as feed or share your links to other social bookmarking sites. API and offline mode are available in Readbag too! Clockmaker Icon Generator is an very simple AIR app that let you create CS3 icon or web 2.0 badges. All you need to do is to enter the word you want to appear on Icon and choose the color you want. It will generate 16×16, 32×32, 48×48 and 128×128 in PNG file formats. 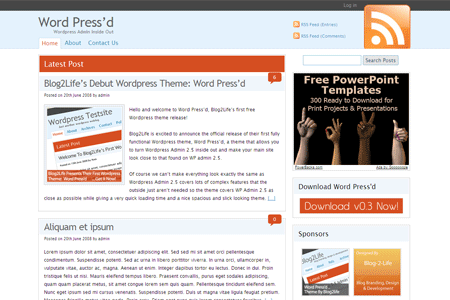 I was taking a look at free wordpress themes which are recently featured in Weblog Tools Collection. I did not see many but the following three are really attractive and catch my eyes. 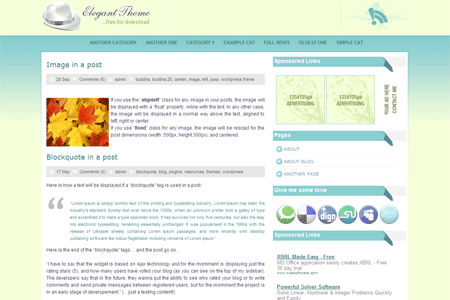 Two columns wordpress theme based on WordPress Admin interface. Two columns with simple color scheme. Really looks professional theme. 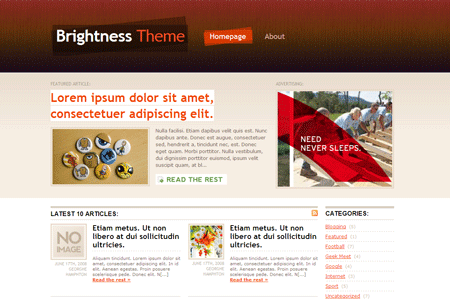 Brightness is a magazine style two columns widget ready theme. You can change the layout in WordPress Admin panel. It uses custom field for featuring posts and displaying thumbnails along with excerpt posts in front page.